Photo: Victor Bryant Louis Richard hits into the block of Casey McGarry and Brandon Hicks. For the second consecutive night a showdown with No. 1 ranked Long Beach State slipped away from the No. 3 ranked UCSB men’s volleyball team. A near capacity crowd of 1, 378 packed into Rob Gymnasium determined to give the Gauchos the necessary boost to upset the defending national champions, but the visiting 49ers remained poised and made clutch plays at key moments to capture a 29-31, 31-29, 25-14, 26-24 victory on Friday night. The Gauchos were riding a 12-match winning streak before the back-to-back losses to unbeaten Long Beach State on consecutive nights. 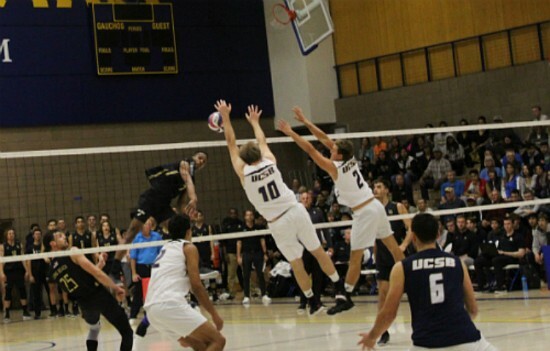 The improvements that UCSB has made over the course of the season were apparent even in defeat as three of the four sets were there for the taking. “The biggest take home from this whole things is that we can compete with the best teams,” said UCSB assistant coach Cullen Irons. “If we take a couple different swings and put a couple balls down we’re out of here in three. In set one, UCSB overcame an early 5-1 deficit and took a 25-24 lead on a cross-court spike by Spencer Fredrick, who tied for the team-high with 16 kills on 37 swings. Photo: Victor BryantSpencer Frederick unleashes a serve as T.J. DeFalco prepares to receive. The two teams went back and forth until a kill by Brandon Hicks put UCSB ahead 30-29. The Gauchos clinched a 1-0 set lead when Fredrick cleaned up a Long Beach State pass that went over the net. However, the 49ers returned the favor in set two as UCSB couldn’t capitalize on forcing set point several times at: 25-24, 26-25, 27-26, 28-27 and 29-28. Long Beach State evened the match at one set apiece when Frederick hit wide. The momentum from the stunning finish to the second set helped Long beach State dominate set three. The Gauchos struggled with their serve-receive and the 49ers took a 2-1 set lead on a kill by Kyle Ensig. In set four, UCSB led 24-21 before Long Beach State ripped off by five straight points behind inspired play from T.J. DeFalco, who notched three kills and a monster solo block during the stretch. DeFalco finished with match-high 20 kills. Long Beach State clinched set four and the match on a kill by Nick Amado. UCSB (15-5 overall, 2-2 Big West) has 14 days off before its next match at home against Cal State Northridge on March 29th.